Thanks for checking out my web site. All of my work is done with linoleum blocks. I carve them with sharp carving tools and usually use a magnifying glass. I either print on paper or fabric. When I am printing on paper, I use regular block printing ink, usually water soluble. Fabric is a different matter. There I use an ink that is permanent to the fabric. It is heat set with an iron. 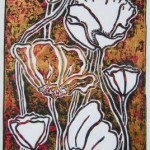 “Tulip and Poppies” is an example on an overprint on Mulberry paper.